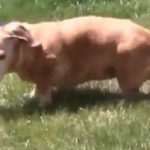 Doree the mini dachshund has a problem with her leg — the patella slides out of place every time she bends the leg. So she undergoes surgery at Columbus Small Animal Hospital to repair the leg. Soon, she is using the leg like nothing ever was wrong with it, and she is going strong when she comes back to visit months after the surgery.